At Cookies con Amore, we are very excited about a new magazine for gluten-free foodies called Gluten Free Forever. And we are proud as punch to be featured in the second issue which hit the newstands at the end of January. (It’s available at 800 stores and counting.) You can also purchase print and PDF copies of the magazine on the Gluten Free Forever website. Cookies con Amore is a big believer that gluten-free and foodie should go together. Gluten-free cookies should melt in your mouth and warm your heart. They should taste so good that you have to double check to make sure they are gluten-free. If you want to know how we do what we do, be sure to check out our blog post on Gluten Free Cookies How We Make Them Taste So Good. 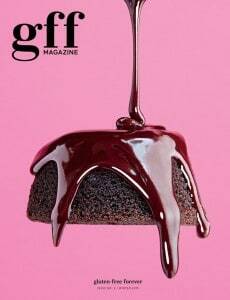 It’s a brave thing to launch a print magazine in this day and age, and we hope that Gluten Free Forever takes off because the publishers are doing such beautiful, mouthwatering work. We think of it as AFAR meets Cooks Illustrated. Or perhaps a gluten-free Saveur. If the cover alone doesn’t entice you to spring for a copy, you need to know about a few of great stories that have captured our interest. For a simple gluten-free winter meal to share with your sweetheart, check out our Valentine’s Day menu. This matches our own motivation for creating the Glutenetto line. When Cookies con Amore head baker Fernanda Capraro, who has been sharing cookies since her childhood in a small Italian village, tried a gluten-free diet, she noticed that felt better but that most gluten-free baked goods were not as delicious as the real thing. She also had friends with Celiac Disease and wanted them to be able to share in the love of a good cookie. She set out to bring artisanal taste and gluten-free health together, believing that gluten-free should taste so good that you don’t miss the wheat. Both Del Posto’s Gluten-Free Focaccia and our Glutenetto cookies have been know to bring tears to the grateful eyes of diet-restricted customers. In our experience, creating gluten-free recipes that make people weep takes a great deal of trial and adjustment with flour blends. To produce our signature crunchy, crumbly Biscotti texture, we had to experiment with various combinations of gluten-free flours. In general, we also find that gluten-free dough is more temperamental than wheat based dough and we need to make adjustments to cooking temperature and time to yield the right combination of crunch and crumble. Follow along (page 46) as this self-taught chef from Massachusetts and proprietor of Michelin Two Star Coi in San Francisco pulls together a relaxed weekend meal. Recipes include: Dungeness Crab and Parsnip Bisque, Roasted Whole Chicken with Herb Vinaigrette, Olive-Oil Crushed Potatoes with Leeks and Tatsoi Leaves, Salad of Chicories and Shaved Radish, Steamed Baby Broccoli with Rice Wine Vinegar and Citrus Jelly with Citrus Ice. We’re foodies and always curious about what other foodies are doing in their kitchens. The best chefs draw from what’s local, experiment with different flavor combinations and tinker with tradition. We are known for our cookies based on traditional Italian recipes, but head baker Fernanda Capraro is always finding inspiration from the cuisine that surrounds her in Southern California. For instance, at Thanksgiving this year she created a pumpkin jam cookie that gave pies across America a run for their money. We love stories like this one in Gluten Free Forever which take us into a chef’s home kitchen, because that’s where the most interesting experimentations begin. « Italian Christmas Cookies: Buon Natale!